The best sandpit in the world? 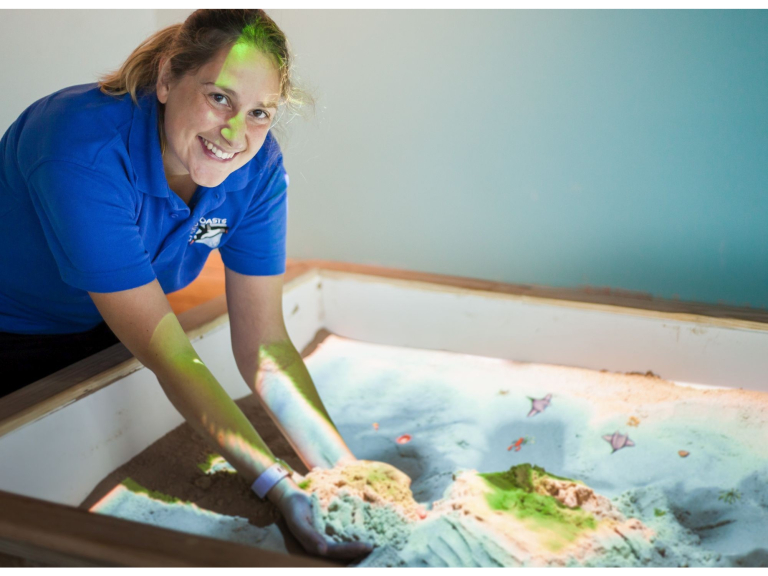 Torquay’s coastal zoo has installed the state-of-the-art augmented reality sandpit to encourage active play and fun exercise. Staff were keen to introduce new technology and saw an example at a trade show. The Animated Sandbox is augmented reality that can be used by several children at once and adds a whole new level to the classic idea of the sandpit. When children shape the sand into mountains and valleys, an overhead sensor maps the area, analyses the change and reacts to it. The raised areas turn green and plants appear randomly. In the low areas, the projection is sea blue and marine creatures appear there and move around. The coastal areas become yellow, like sand on a beach, and crabs appear. Operations Manager Clare Rugg: “It’s really quite amazing. When the system detects someone moving around the sandbox, more creatures appear in that area. The creatures and plants react to height and stay in their natural environment. The combination of direct physical interaction, a familiar tactile material like sand and the technology work together in a surprising and delightful way. It’s fun, active and creative. Staff love it – but they have to give way to guests when we open at 10:00am!” For more information go to www.livingcoasts.org.uk or ring 01803 202470.